Indeed, if there are things that are unique, it is strange than others that people become curious, especially if they are updated through social media, the info quickly spreads and becomes viral. Like Sutini's mother's house, her house, which was built like a stone, is now viral even though it has been around for 16 years. In the past week the virtual world was shocked with stone houses similar to those of Patrick SpongeBob cartoon character who was in Mujing Hamlet, Genengharjo Village, Tirtomoyo District, Wonogiri Regency, Central Java. Sutini's stone house was viral in cyberspace after being posted on social media. One of them is on the Facebook group Wonogiri and Wonogiri News. It did not take long, a 9 x 9 meter two-story house designed similar to a stone was built for six months by five artisans. Also read: Unique Facts on Bus Tayo Sukoharjo, Viral in Social Media to Cartoon Film "Construction of the stone house around 2002 after a year I graduated from STM. The house was built by five people and worked for six months at a cost of around one hundred million rupiahs. this is living in the stone house of my mother and grandmother, "said Nurwono, Sutini's eldest son to Kompas.com, Thursday (05/12/2018). This is the entrance to the stone house belonging to Sutini, a resident of Mujing Hamlet, Genengharjo Village, Tirtomoyo District, Wonogiri Regency, Central Java. (Documentation Nurwono) Nurwono said that the construction of the stone house was not inspired by any film. At that time, his father built a stone house because of his work which often built houses and parks. "So the inspiration for making stone houses has nothing to do with film. Because at that time there was no SpongeBob movie. The construction of the house began with the desire of my father who likes to make a garden. The park usually has round stones. Then my father's idea came out that if the stone was made by the house what it would be like, "said Nurwono. His father had the character of building a house and a garden that he did not want as someone else had done." Genengharjo Village, Tirtomoyo District, Wonogiri Regency, Central Java. (/ Documentation Nurwono) Not only that, the conditions inside the stone house are not stuffy. Many windows are made at various points of the house so that air circulation can run well. Meanwhile, the first floor of the stone house is a model room and living room partitioned with cabinets. While the second floor is left empty. After viral on social media, every day his mother's stone house was visited by 300 people. Genengharjo Village, Tirtomoyo District, Wonogiri Regency, Central Java. 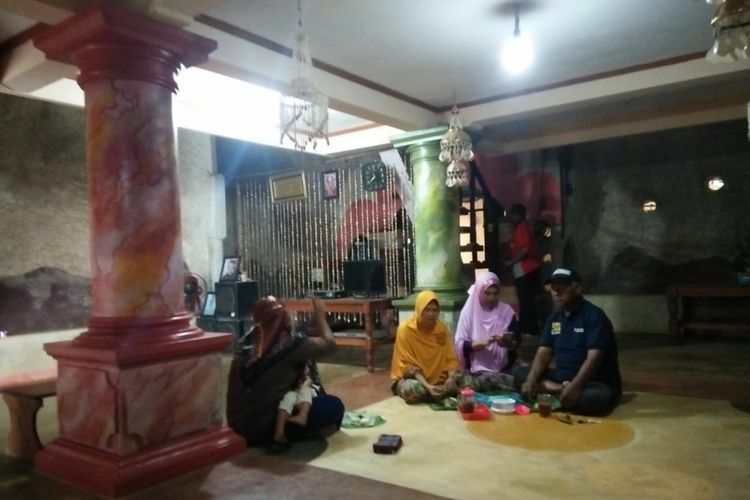 (Documentation Nurwono) His feeling, after his family's stone house was viral on social media, the Sutini family felt proud and happy. At least his father's house can inspire many people. "When I come home, many say I want to make a stone house. But the matter of realization is correct or not, I don't know," he said. Nurwono. Despite being unique, the stone house also has social functions. When the earthquake and landslide arrived, many neighbors took refuge in the stone house. "The neighbors feel safe when they stay at home. Because the house will not collapse, "concluded Nurwono. This article has been aired on Kompas.com with the title "Viral Stone House" Patrick SpongeBob "in Wonogiri which is often a Refuge", https://regional.kompas.com/read/2018/12/07/08464661/viral-rumah -batu-patrick-spongebob-di-wonogiri-which-often-so-place. 0 Response to "SpongeBob's stone house Ibu Sutini in Wonogiri Viral"